Earth. 700 years in the desolate future. A small robot that looks like E.T. crossed with the Mars Rover Sojourner blissfully rolls along on little tank treads, compacting trash into cubes that he builds into towering trash skyscrapers. He is a Waste Allocation Load Lifter, Earth class – WALL-E.
Humankind has abandoned the ravaged Earth, leaving only their refuse behind, which stretches into orbit like filthy facsimiles of Saturn’s rings; a dystopian, disturbing, Terry Gilliam-like vision, tempered by a smarmy CEO (Fred Willard, the first live human integrated into Pixar animation) entreating us with space as the final frontier, in holograms re-playing to dead cityscapes. WALL-E is the last of his kind – broken-down WALL-E’s litter the blighted garbage-land. Unmindful of the dead planet, he plies his trade in simple joy. On his time off, he fills a cooler with artifacts, retiring to a derelict trailer each night (with a free-roaming pet cockroach) where he files everything, while watching HELLO DOLLY on VHS and yearning for tactile contact. Pixar Studios have slammed another one right outa the park! Written and directed by Andrew Stanton (FINDING NEMO, 2003), WALL-E is one of the few original movies this season (not a sequel or remake or derived from a TV show). How does Pixar craft these ingenious, inventive nuggets (where each viewing reveals new discoveries)? Their movies and characters are imbued with so much energy and verve, authenticity hits our nerves in all the right g-spots. A combination of effective storyline, unbridled 3D animation and cuteness so contagious it’ll burn your breakfast. 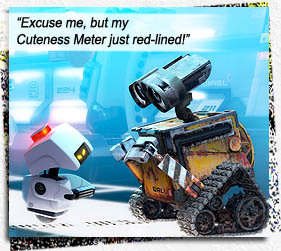 WALL-E immediately falls in love. Or at least rusty lust. So begins a wondrous, accidental journey for WALL-E and EVE, back to the AXIOM, the spaceship housing all Humankind. By bringing back a lone plant, EVE signals Humankind may safely walk the Earth again. But there is a slight problem: over seven centuries, Humankind have become hover-chair blobs, insensate slaves to Big Brother holo-screens in front of their triple-chinned faces – Humankind can’t think anymore, let alone walk, their bones and muscles atrophied. Again, the horror of this totalitarian society might have slapped us in the BRAZIL bone was it not for the Pixar team injecting robot buffoonery at every pixel. EVE’s plant becomes the symbol for freedom and sparks a power struggle between the ship’s evil computer (voiced by Sigourney Weaver), who wants to destroy the green and continue cruising amongst the black, and the AXIOM Captain (a more cognizant blob than the passengers, voiced by Jeff Garlin), who is aided by WALL-E and EVE in potting the plant to drive the ship Earthward. Only the insane are offended by the insanity of the ship’s computer, who Stays The Course supposedly for the good of Humankind, while keeping Humankind blind to the actual good it can bring upon itself. The Earth, after a Republican presidency. Anthropomorphism: when EVE fires on WALL-E, he cowers and shivers. Why do humans shiver? Because our adrenalin is pumping for Fight Or Flight – has robotics advanced to the point of installing non-utility adrenal glands in cleanup robots? Computerized beings desiring company and holding hands: organic life seeks to replicate its genes. “Holding hands” and “love” precipitates continuance; they are means to an end – but with robots, holding hands IS the “end.” The last shot shows them touching foreheads and holding hands – how nice – now what? Metal coupling? To what purpose? The ship’s “gravity”: the evil computer takes over, slams its steering wheel left and tilts the spaceship (! ), making all the blobby humans careen to one side… er, how? Artificial gravity is created by a spaceship’s axial spin. Since this ship is not spinning, gravity has nothing to do with the direction of the ship’s steering wheel. Deep space exodus: why the economic stupidity of piloting a spaceship into deep space, even though it plans to return to Earth eventually? There are two stable Lagrange Points (L4 and L5) on Earth’s orbit where a ship could perch without any fuel expenditure at all, and would eradicate the need to traverse billions of miles through theoretical hyperspace and wormholes on the return trip. Writers: Andrew Stanton, Jim Capobianco. Starring: Ben Burtt, Elissa Knight, Jeff Garlin, Fred Willard, John Ratzenberger, Kathy Najimy, Sigourney Weaver.